Water Filled Building Blocks Also Teach A Finger-Paint-Free Lesson About Color Mixing | OhGizmo! Any kind of building block toy is OK in my books since it encourages kids to use their imaginations. And if someone manages to find a way to make them educational at the same time, like these clever Water Blocks, well then more power to you! 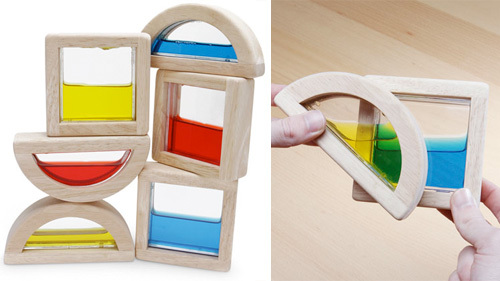 Made in Thailand from sustainable rubberwood, the blocks each feature a window filled with red, blue or yellow water. When held together the blocks appear to change color, providing a useful lesson in color mixing without ever having to break out, and subsequently clean up after, the finger paints. Sadly, like most educational toys, the Water Blocks aren’t cheap, and a set of just 6 blocks which can barely produce the front wall of a castle will set you back $39.99 from ThinkGeek. How cute. I love blocks and yes, giving them an educational edge is really stepping it up.